Clinical Significance – Most commonly seen in osteoarthritis and similar to, but much more common than, Bouchard’s nodes of the proximal interphalangeal joints. They are much more common in women and seem to have a genetic predisposition. History – Named after William Heberden (1710-1801), who was an English physician and received his medical doctorate from St. Johns College in Cambridge in 1739, where he made his name a distinguished medical lecturer at the university. He received fellowship in the Royal College of Physicians in 1746 and then the Royal Society in 1749. He njoyed a prolific medical practice in London and Paris for over 30 years. While semi-retired, he worked on a collection of papers for the Royal College of Physicians to be transcribed into a three volume textbook entitled Medical Transactions. 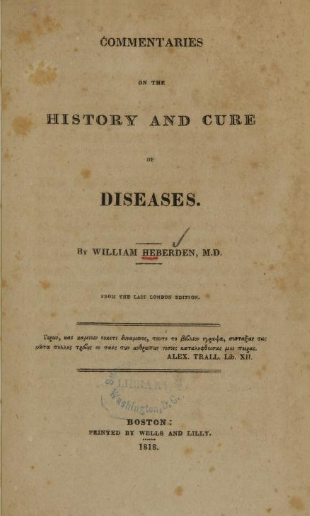 These were eventually revised and transcribed in English, by his son William Heberden the younger, which included a chapter on arthritis by Heberden the elder describing these findings. I wanted to send a little post out for those that subscribe to the blog, but also for anyone that is following me on social media. One of the core tenets of a successful online presence is consistency and predictability. I have prided myself on producing content fairly regularly over the past year and I will continue to do this…….once I get this thing called life settled out. As you all know, I started my new position as program director at the University of Tennessee Health Science Center PA Program in January and have been commuting home to Birmingham every weekend for the past 4 months. I usually have some time worked into the weekends to schedule some of the content (Motivation Mondays, Wednesdays Ep-PAINE-nyms, Saturdays PAINE PANCE Pearls) in advance so it gets outs even if I get busy. We finally closed on both our houses (Birmingham and Memphis) in the last 2 weeks and we are finally getting one step closer to be a one zip code family. My amazing wife is still living in Birmingham for the next 2.5 weeks to get the kids finished in school Alabama, but this entails living in hotels or her mother’s house. Every extra moment of time I have now is devoted to painting and assembling furniture in the new house so it is ready to go when the family arrives at the end of the May. I will be back in full swing on June 1st. Again….my apologies for the lack of content for the past few weeks, but we will be up and running again soon.